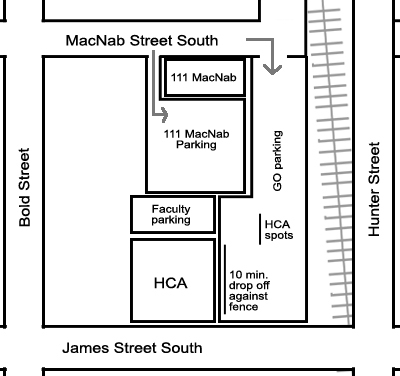 The HCA is located at 126 James Street South, with parking spots reserved in the GO Station Parking Lot located on MacNab and Hurst Street behind our building. Look for the signs that say “GO Station – Conservatory for the Arts”. We also have spots at 111 MacNab, just before the GO Station parking. They’re along the back of the house. If you have any questions please call 905-528-4020. – Left @ Fennel St.
– Right @ MacNab St.
For parking in downtown Hamilton, you can access a downloadable map here.